While no one can predict the future with certainty, this much is clear: the future of corporate real estate (CRE) won’t look anything like its past. We live in a world that is more globally connected than ever before, changing more rapidly than ever before, and constantly disrupted by technological innovation. It is replete with both risks and opportunities. These and other major trends are transforming how, where and when global business is conducted. Now, more than ever, it is crucial that corporate real estate (CRE) professionals become not only students of the business, but students of the world and how it is changing. This is the purpose of this report: to place the future of CRE in the context of the bigger picture. 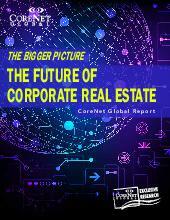 This report includes the key findings of a year-long project in partnership with CoreNet Global’s Gold Strategic Partners to research the future of Corporate Real Estate.